Are you concerned about the signs of ageing? Wish you could do something to help reduce the size of those pores, reduce fine lines and wrinkles, or maybe just lighten some brown spots or simply tighten your skin? However you don’t want the down time and pain normally associated with conventional laser resurfacing procedures? 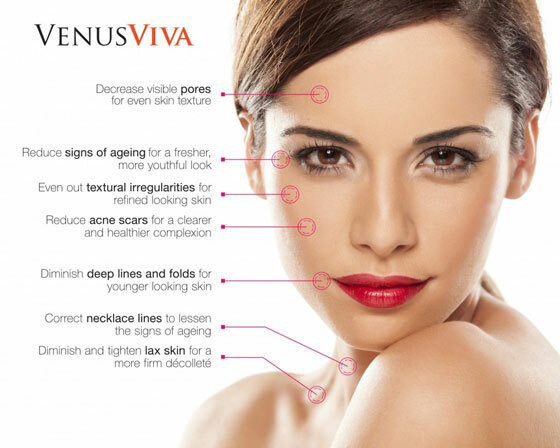 Venus Viva is the latest noninvasive anti-aging resurfacing treatment. It is FDA approved and safe, and you will start to see a brightening and tightening after your very first treatment. This initial treatment only compounds during your series of sessions and you will continue to develop improvements 2-6 months after your series of 3-4 sessions is completed. The treatments will even out your skin tone and texture, and the best part is you only have 24 hours of redness. You can carry on with usual activities the same day and can apply mineral make up 24 hours after your procedure, so virtually no downtime. A series of nan-fractional Radio Frequency treatments stimulate your own collagen and give the skin a glow or brightness which is great program for those with fine lines, larger pores, acne scars or those who have already had some resurfacing and just want some maintenance to refresh and rejuvenate the skin. Get in touch today to see if you are a candidate. Venus Viva is a non-invasive, but ablative treatment combining Nano Fractional Radio Frequency and a Smart Technology to remodel and resurface the skin. The pulses emitted from the hand-piece are ablative, meaning they cause very small microscopic pores in the dead skin cells, which generate heat stimulating fibroblasts and rebuilding collagen. Venus Viva treats both the surface skin layer (epidermis) and deeper skin tissue (dermis) unlike some technologies which are only able to treat a more superficial layer of skin. The Venus Viva method maximizes the benefits while minimizing the discomfort and recovery. The Viva Diamond Polar is a skin tightening device which can be used alone or to maximize results alongside the Venus Viva treatments to both complement and boost. The Viva Diamond Polar uses radio frequency in combination with magnetic pulses that stimulate the formation of both new collagen as well as elastin fibers over a period of time. Recommended 6 sessions for the face/neck and 8-10 for the body. Diamond Polar treatments are very comfortable with no drugs or numbing cream required with simple skin warmth and redness which fades within a couple of hours. The Venus Viva can be used on any part of the body except eyelids and lips. Virtually no downtime – Your normal activities can resume within hours of treatment and any redness can be covered with mineral makeup 24 hours after a session. This is in contrast with the usual days and often weeks of downtime required after more conventional laser resurfacing sessions. Please note that as with any procedures results vary from client to client and cannot be guaranteed. What Can the Venus Viva do for you? Please notify your technician if you have any of the following possible exclusions. Do not use anti- inflammatory products as ibuprofen one week before or after your treatment sessions. The inflammation created by the Venus Viva and Venus Diamond Polar is part of the process of stimulating your new collagen. A series of photos will be taken and consent forms will be reviewed and signed. Your make up will be removed and your skin will be cleansed and wiped with alcohol. You will be asked to remove any jewelry including earrings and necklace as a safety measure. If you wish, a complementary numbing cream will be applied to the area being treated by the Venus Viva, approximately 20-30 minutes prior to your session. For skin tightening only with the Diamond Polar, a thin layer of gel will be applied just to help the applicator glide across your face. You will be kept very comfortable throughout the procedure as the technician will customize the settings, so you will feel only a mild snapping and heat sensation and with the Diamond polar just a lovely warm sensation. Immediately after treatment you will experience redness and possibly some light swelling in the area. This should subside after a few hours and we encourage you to keep the area very clean, no touching the face and we strongly suggest to go home and put a clean pillowcase and the hard part – do not use ANY products for the rest of the day. This ensures that you maximize your results and remember no ice as this will bring down the inflammation. Controlled inflammation is what we are seeking so as to stimulate the collagen and elastin production. We do not want any post treatment infection which could show as small white pustules. 24 hours later you can apply a mineral makeup but do not use any product that exfoliates e.g. glycolic, salicylic acid or retinols for at least a week. Just let your skin heal naturally. You may experience itchiness, which is part of the healing process. Please do not itch or scratch the treatment site. After 24-72 hours you may notice small pinpoint crusts where the electrode pins of the device contacted the skin. These will resolve very quickly and can easily covered with mineral makeup. Venus Viva treatments are most effective when taken in a minimum series of 3-5 sessions typically 4-6 weeks apart. Multiple treatments are needed for the full benefits and you will continue to see improvements developing as much as 2-6 months after your series is completed so please be patient. A series of 3 treatments every 1-2 years helps to maintain your results. To maximize your Venus Viva results you can also do weekly Diamond Polar treatments in between. Ask your technician about the special pricing for this combo and how best to schedule these appointments. Get in touch today for a consultation with one of our certified technicians and see if the Venus Viva is right for you.